APR is an American based company that for nearly 20 years now have focused on performance enhancements to VAG group vehicles. APR have one mission, and that is to engineer only the highest quality tuning solutions for Volkswagen, Audi, Porsche and Skoda vehicles ensuring the enthusiast the ultimate driving experience while consistently providing the enthusiast with premium customer care and support through the APR dealer network. Andrews High Tech Automotive is proud to be your APR Dealer on the Sunshine Coast. As such, our tuning specialists are on standby to transform your vehicle with fitment of APR software and hardware products. You don’t even have to live on or near the Sunshine Coast to enjoy the benefits of an APR upgrade. We happily extend our services from the Sunshine Coast through to Cairns. That is the beauty of APR software, we don’t need your car, just the ECU (computer) and our bench programing system can deliver the powerful upgrade. We hold a wide variety of APR hardware components in stock to either fit to your vehicle for you, or ship to you preferred address should you not live in the local area. Until you experience the drive for yourself you can’t truly appreciate how much power there is available in your engine. That is why we have two demonstrator vehicles available for you to drive and enjoy the APR difference. One Golf R and one Golf 1.4 TSi are ready when you are – some conditions apply to qualify for a test drive. APR’s ECU upgrades dramatically increase horsepower and torque, making for an exceptionally quicker and more exciting vehicle. This is made possible through APR’s optimization of the factory engine management system to take full advantage of the engine’s capabilities, without needing any end user adjustment. The software loads to the factory ECU through the OBD-II port (often referred to as port tuning) resulting in a clean and headache-free install. For information on pricing for software products, hardware products, and installation prices, or to answer any other questions you may have please contact Andrews High Tech Automotive and ask to speak with one of our tuning specialists. (07) 5443 4610. Don’t settle for second best. There are many performance enhancement software solutions on the market for VAG group vehicles. 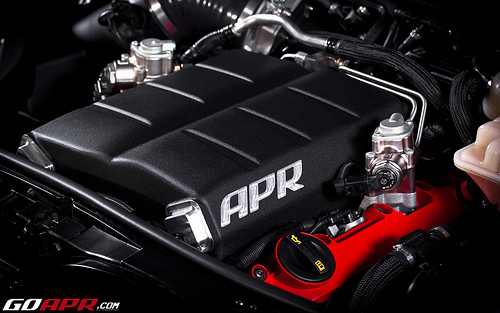 No other company has put the time, effort and investment into producing the ultimate performance tune like APR. They have been doing what they do for nearly 20 years now and no competitive product can surpass the power and torque outputs of an APR tune.